If you asked Southern Illinois University Edwardsville student Zia Hasan Ansari what he wants most for the holiday season, he’d say world peace – starting with the end of the Syrian Civil War. But Ansari, president of the SIUE Muslim Student Association (MSA), and members of his group, along with students in the SIUE Arabic Club, were moved to assist in one tremendous humanitarian effort in the meantime. The two groups joined with Helping Hand for Relief and Development to collect more than 40,000 pounds of donations that included food and clothing for Syrian refugees. Helping Hands contacted a member of the MSA to see if they could help. The group gladly accepted and then brought the idea to the Arabic Club. “When we joined the project, there was already 10,000 pounds of donations in the form of food and clothing collected and stored in the Helping Hands’ warehouse,” Ansari said. The student groups also collected clothes and shoes from contributors in Edwardsville and St. Louis. “We collected items from people’s homes and mosques,” Ansari said. “Some people even dropped off items themselves to the (Helping Hands) warehouse and to me at the SIUE campus. Tamari is a Syrian expert. He and his wife, Sandra, assistant director in International Affairs, lived in Damascus for 3½ years. The couple still has family and friends living in Syria. The Muslim Student Association’s mission at SIUE is to enrich the diversity on campus by uniting the growing Muslim community and educating our peers about the religion of Islam. To learn more about SIUE’s MSA, contact the president, Zia Hasan Ansari at zansari@siue.edu. SIUE's Arabic Club’s mission is to promote the Arabic language and Arab culture, and to educate students about the Middle East. To learn more about SIUE’s Arabic Club, contact the president, Ramsha Ansari at rdurran@siue.edu. 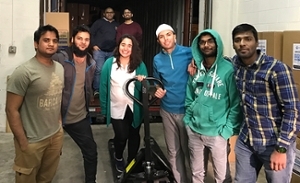 Helping raise and process donations for Syrian refugees are (front row L-R): Khazi Ghani, Mohammed Ateef, Dara Garcia, Mohammed Chakir, Mohammed Sayeeduddin and Mohammed Muneeruddin. Seen in the background are Musab Zafar (left) and Mohammed Maqsoos.